“What do you want to make?” I asked. “I want to stir fry chicken with fermented black beans, black mushrooms, fresh shiitake mushrooms, Shao Hsing wine, soy sauce, ginger, garlic, shallots and chiles,” she reeled off at top speed. I nodded. “Sure, why not? We have plenty of chicken, and you know where the rest of the stuff lives.” To myself, I chuckled inwardly, counting up the umami-filled ingredients: fermented black beans, dried and fresh shiitakes, Shao Hsing, and soy sauce. I plotted to sneak some sesame oil in at the end in order to pump up the savory umami flavors. She scurried off into the kitchen, and set the mushrooms to soaking, and began gathering up ingredients, moving with efficient speed. She cut everything up herself, while humming and bouncing hither and yon. I followed her and took photographs, offering help and advice, but mostly, I stayed out of the way. She only faltered once, when it came to figuring out how much cornstarch to use in marinating the chicken with the wine, but I added another half tablespoon and all was well. I saw that she had cut the chicken into fairly large chunky cubes, but I kept silent and let her go on. Finally, all was prepared, and it was time to cook. With camera at the ready, I watched as she carefully lined up the bowls of ginger, garlic, shallot, chile and fermented black beans next to the wok with the peanut oil. 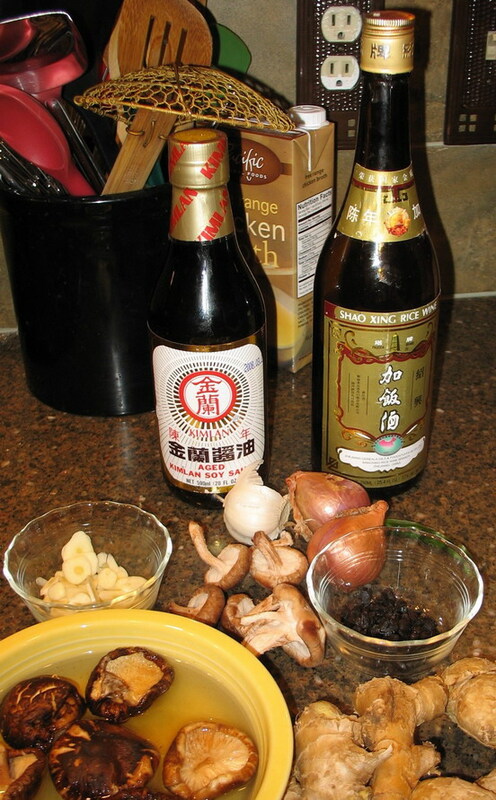 Behind this first array of ingredients came the chicken, a little bowl of combined mushroom soaking liquid (carefully ladled out so as to leave all the grit behind) and chicken broth, and the bottles of Kimlan aged soy sauce and Shao Hsing, already open. Behind them was the cut, rinsed and dried gai lan in a colander, and the sesame oil bottle. She took up the wok spatula, took a deep breath, and lit the burner under the wok. Now, let me explain. Because the burner gets so hot, in order to hold one of the short, earlike handles that are typical of the Cantonese cast iron woks, one has to use a folded side towel. I mean, the blue flame comes halfway up the wok’s sloping sides, so that sucker gets really warm, really fast. So, she had a rolled up towel in her left hand, ready to use. She had very carefully folded it into a controlled wad that she could maneuver easily around the handle to stableize the wok on the burner and to keep it from trying to scoot away as she vigorously tossed the ingredients with the shovel. She discovered something. When you set down the towel to grab ingredients to toss in the wok, it has a tendency to unfold itself, unfurling like a little flag. The first time she set it down, it only unfolded a bit, so she wadded it back up and kept working. The second time, she misjudged how well she had refolded it, and a corner of it dipped down into the flame. It burst into fire in her hand. I watched in amazement as she very calmly and deliberately turned, set down the wok shovel, turned off the burner, and carefully held the flaming towel away from her body and walked it to the sink. She dropped it in, turned the water faucet directly onto it, then walked back to the wok, turned the burner back on and went back to cooking, all AS IF NOTHING HAD HAPPENED. I had a camera in my hand, and never thought to snap a picture of the very dramatic proceedings. I shouldn’t be surprised, mind you. I have taught her to never panic around emergency situations and have always modelled calm, unemotional behavior in a crisis. And she is really pretty sensible herself, so it all turned out well. The meal turned out quite well. When she asked me how she could improve it, I pointed out that because she had cut the chicken into such large chunks, we had to add extra liquid to the recipe to cook it down without drying it out, or making the outside a crusty mess, so it diluted the flavors. The next time she cooks it, she vowed to cut it into thin slices. Other than that, it was perfect–a very good summation of how to use various of the umami ingredients I have been writing about for days together in one recipe. Mix chicken breast slices with wine and cornstarch and allow to marinate for at least twenty minutes. Heat wok until it smokes. Add oil, and heat until it shimmers and just starts to think about smoking. Add shallot, black beans and chile and stir fry vigorously until shallots begin to brown and turn golden. Toss in ginger and garlic and continue stir frying about one more minute, taking care to keep it all moving so the garlic doesn’t take it in its mind to burn. Add both kinds of mushrooms, and stir fry for about thirty seconds, then add chicken. Spread over bottom of wok in a single layer and allow to brown on the bottom for about thirty to forty seconds before tossing hither and yon in the wok rapidly. 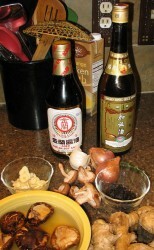 When the pink is halfway gone, add the soy sauce and wine, and continue stir frying until it is mostly cooked. 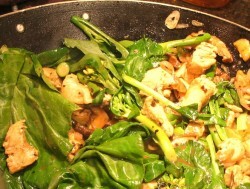 Add gai lan, pour in the broth and mushroom soaking liquid mixture and toss. Cover wok with domed lid, allow liquid to simmer for about forty seconds to a minute, take off lid and stir fry until most of the sauce is thickened and clinging to the food, and the gai lan is bright green and crunchy-tender. Take off heat, drizzle with sesame oil, stir once more, then scrape from wok into warmed serving platter. Hi! First time commenter here (I think). I was just re-reading through the recipe and noticed…well, at least an oddity. “2 tablespoons Shao Hsing wine” is listed twice, but I only see it added once in the instructions. And please tell Morgannia that people do ‘love’ her 😉 . This lurking reader thinks it’s absolutely cool that she’s following in your footsteps to learn how to cook, especially Asian foods. Most American kids in the Midwest (of which I was one once) don’t learn it until much later. And since I’ve gone ahead and posted anyway, just wanted to leave a note letting *you* know how much I admire and enjoy reading your blog. That you can tackle intricate Asian dishes and ‘white trash’ Appalachian cooking with equal aplomb appeals to me, since it matches very closely with my own cooking experience. Thank you again for sharing with us! Alix, thank you very much. I am sorry it took me a while to get to your comment, but it did not go unnoticed. I will edit the instructions to fix that omission of a step of what to do with that wine. It gets used in the marinade, and then more is added later. I forgot that “later” part. Ooopsie. Morganna knows that she is beloved–in fact, this recipe was a post of the week on another blog (Cooking withi Amy) the weekend it was posted, and she was thrilled. I, too, am very happy that she wants to learn to cook at an early age as well. While I am at it, I go out of my way to teach her friends, too, because I know it is hard to learn cooking basics and techniques later in life. I just think it is important for everyone to know how to cook, and so I try and teach everyone I get ahold of. I guess that is part of why I enjoy blogging so much–I can’t fit the world in my kitchen, but I can try and send my kitchen out into the world. And thank you for your kind words. It does mean a lot to me to know that I am reaching people, not just on a literary or intellectual level, but also on an experiential, emotional level as well.